Content has become a staple in every company’s marketing strategy. As content is shared and consumed at an unprecedented scale across the Internet, it has influenced a shift in consumer behavior and has presented new opportunities for brands across various industries. Today, every brand is a publisher in their own right. However, brands need to be more than content machines to truly succeed in content marketing. Marketers must understand the ecosystem that surrounds their content, how that content performs and how it drives business results. BrightEdge tapped into its massive Data Cube repository, which analyzes billions of pieces of content from across the web, to provide a comprehensive view into the channels that drive traffic and the types of content that perform best. 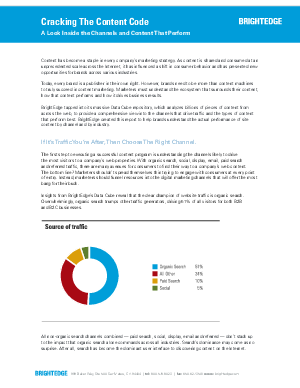 BrightEdge created this report to help brands understand the actual performance of site content by channel and by industry.